Hilary Marusak, Ph.D., a post-doctoral fellow in Wayne State University’s Department of Pharmacy Practice, was awarded a Supportive Care Research grant from the St. Baldrick’s Foundation, the nation’s largest private founder of childhood cancer research. The one-year, $50,000 grant will support Marusak’s work studying whether a martial arts therapy that focuses on meditation and breathing techniques can reduce pain experienced by childhood cancer patients. Christine Rabinak, Ph.D., Felicity Harper, Ph.D., and Dr. Jeffrey Taub of WSU are study co-investigators. 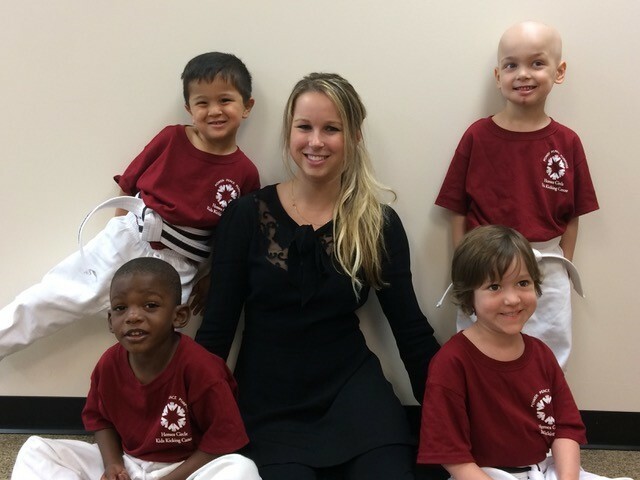 Marusak, who earned a Ph.D. in translational neuroscience from Wayne State in 2016, will work with Kids Kicking Cancer, a Michigan-based nonprofit that teaches children fighting cancer the mind-body techniques of martial arts instruction, breath work and meditation. The organization, founded by Wayne State University School of Medicine assistant clinical professor of pediatrics Rabbi Elimelech Goldberg, offers these classes at hospitals free of charge to help children move beyond the pain and discomfort of their disease. While there is evidence that these kinds of behavioral therapy techniques have had strong effect on pain, distress and underlying brain areas in adults, Marusak said that little research has been conducted on how they impact children’s brains. Marusak’s research, which is also supported by the American Cancer Society, will focus on 14 children between the ages of six and nine who are either cancer patients or survivors. She will survey them about their pain levels, emotions and mental health, and then complete a non-invasive MRI scan to look at their brain structure and function, specifically within pain and emotion processing brain areas. From there, the children will complete four classes with Kids Kicking Cancer before returning for a comparison survey and MRI.